Happy New Year from The Flickcast! Since much of Hollywood, and the entertainment industry, takes a break during the week between Christmas and New Years, The Flickcast will be taking some time off too. But don’t worry, we’ll be back in 2015 with new content, new episodes of The Flickcast podcast and a whole lot more. See you then. Happy New Year from The Flickcast family! This is a holiday week here in the United States and as a result the staff is taking a bit of time off to celebrate with family and friends. So, that means we’ll have a reduced posting schedule for today and for the rest of the week. Also, due to travel schedules and such, we won’t be having a new episode of The Flickcast this week either. Sorry folks. Look for that to return next week. Of course, if breaking news happens, we’ll bring it to you. Otherwise, expect to see us back to normal (or our version of it) on Monday, December 2nd. It’s a holiday here in the United States and a day we remember all the men and women of our armed forces who’ve paid the ultimate price for our freedom. Because of this, and because we like to let the writers have some time off occasionally, we’ll have a reduced posting schedule today and will resume our normal schedule tomorrow. To our readers in the U.S., have a great holiday. For the rest of you from other countries, thanks for reading and we’ll see you tomorrow when everything is back to normal around here. Well, as normal as it gets anyway. Hello friends. In order to serve you better, we are currently in the midst of migrating our network of sites to new, improved servers. While we do that you probably won’t see anything new here. Once the migration is done, we’ll be back to our regular schedule of posts, articles, reviews and more. We appreciate your patience during this time of transition and we hope to see you back here real soon. Until then, here’s some pics of girls dressed in Star Wars stuff. Pandering? Us? No way. Today is a day in the US when we honor those leaders who made a difference in our country’s history. So, for today we will all be out doing pretty much anything else besides work. Even though we don’t like it, we sometimes have to let the team out of their rooms and out into the world. Don’t worry, it’s only for a few hours. We’ll be back tomorrow. For those of you not in the US please, enjoy your Monday. For those who are, enjoy this day of rest. In the United States, this is the time of year when Hollywood virtually shuts down and people leave town to visit family and friends. Plus, the staff here at The Flickcast actually has family and friends as well and many of them are doing the same. So, for the next week or so we will have a reduced posting schedule. Of course, if anything big happens, we’ll bring it to you. Also, be sure to look for our “Best of 2011″ articles covering movies, TV, comics, games and all things geek before the end of the year as well. 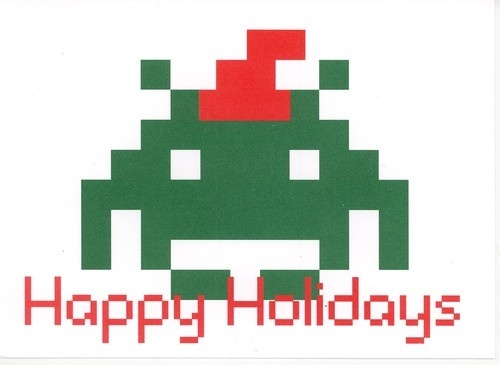 In the meantime, from all of us here at The Flickcast, we wish all of you the very best for this holiday season and happiness, health and luck for 2012. Today is a holiday here in the United States which honors those who, well, labor. So, to commemorate this great feat, we will be giving the fine folks who write this site the day off. Expect to see a few articles today, but not as many as we usually bring you. Of course, if something major happens, we will bring it to you. Otherwise, expect our usual brand of humor, articles, interviews, reviews and more to return refreshed and ready to roll tomorrow. We wish you a happy holiday and we’ll see you on the other side. As many of you know, it’s a holiday weekend here in the U S of A. That means all around the country people are getting together for food, fun, sun and the adult beverages of their choice to celebrate our independence day. This seemed like as good a weekend as any to give the hard working staff here at The Flickcast some much deserved time off. We’ve got quite a few things coming up over the next few months, including the big one called Comic-Con in San Diego, so we’re going to take it easy this weekend. Consequently, our posting schedule over the weekend and on Monday, the actual 4th of July, will be much lighter than usual. If a big story breaks, we’ll bring it to you. Otherwise, we’ll be back to our version of normal on Tuesday, July 5th. Happy 4th of July weekend to those of you who celebrate it. For the rest, enjoy your weekend. To add to the fun, we’ve included a little video to help set the mood. Click through to check it out. Thanks for reading and we’ll see you on Tuesday. It’s a holiday here in the United States and a day we remember all the men and women of our armed forces who’ve paid the ultimate price for our freedom. Because of this and because we like to let the writers have some time off occasionally, we’ll have a reduced posting schedule today and will resume our normal schedule tomorrow. To our readers in the U.S., have a great holiday. For the rest of you from other countries, thanks for reading and we’ll see you tomorrow when everything is back to normal around here. Well, as normal as it gets anyway.